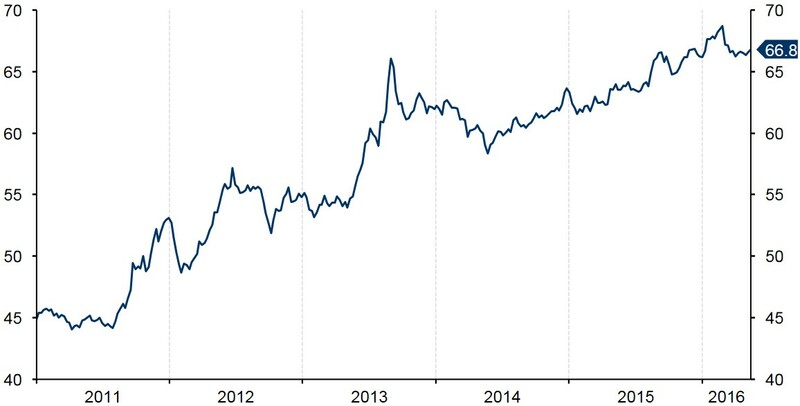 The Indian Rupee (INR) has held up relatively well, in the context of most emerging market currencies, suffering only a very mild and gradual depreciation against the US Dollar since mid-2014 (Figure 1). The currency has been well supported by India’s relatively strong economic performance. This relative INR strength has come despite a series of interest rate cuts over the past year, which were intended to boost Indian inflation. After the latest cut in April, the Reserve Bank of India has brought its benchmark interest rate all the way down to 6.5%. Persistently low inflation, and government plans to lower the budget deficit to 3.5% of GDP this year, is expected to force the RBI to cut rates further in the coming months. Consumer price growth has remained low and has been below the bank’s upper target of 6% for about a year and a half (Figure 2). 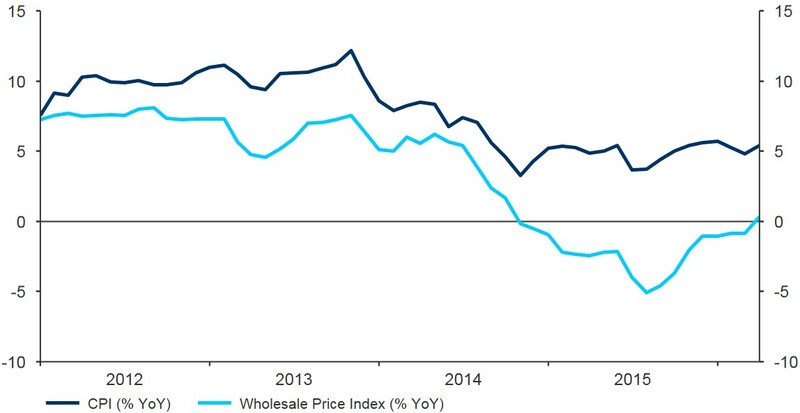 The recent rate cuts, coupled with poor harvests and a moderate recovery in oil prices, appear to have stabilised inflation around its highest level in over a year. Real interest rates in India, however, remain positive and have increased to around 1.5%, which should continue to provide some support for the Rupee. Economic growth in India has also continued to be strong, with the recent oil price slump positive for the predominantly oil importing Indian economy. GDP growth dipped to 7.3% in the fourth quarter, although India remains the fastest growing major economy in the world having outpaced China last year. Growth is expected to remain robust in 2016 and well above 7%. The current account deficit has seen a massive improvement in the past few years and is now largely closed. 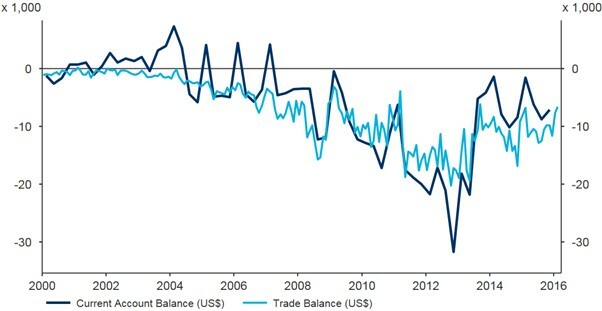 With oil imports now double oil exports, the recent plunge in oil prices has been a sizable net positive for the balance of trade, which has experienced one of the sharpest improvements of any major emerging market economy over the past three years (Figure 3). The Reserve Bank of India has also actively intervened in the foreign exchange market, selling its US Dollar reserves in the past few months in order to limit volatility and prevent an excessive Rupee depreciation. 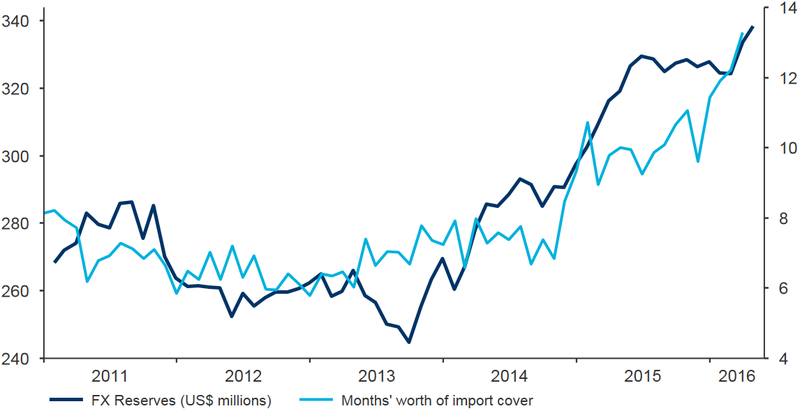 However, India’s foreign exchange reserves remain lofty, reaching an all-time high level in March. They are now ample at above the equivalent to thirteen months’ worth of import cover (Figure 4). Governor of the Reserve Bank of India Raghuram Rajan has suggested that the central bank will not hesitate to use its FX reserves, to keep the currency well supported in the coming months. What does the future hold for INR? The stream of supportive factors, including rapid growth, an improving current account and intervention from the central bank leads us to expect a mostly stable Rupee against the US Dollar during the remainder of this year and throughout 2017. This, in our view, would ensure a gradual appreciation of the currency against the Euro, given the large scale easing measures announced by the European Central Bank. The Rupee should also experience a moderate depreciation against Sterling. Get in touch to discuss your Indian Rupee exposure.